Thirty-one commemorative US stamps were issued between 1963 and 1964, making an average output of about fifteen commemorative stamp issues per year. The 5 C. denomination stamp shown above, at the left (Sc. #1230), was issued on April 6, 1963 to celebrate the 300th Anniversary of the Carolina Charter. The design of these US stamps features the front page of the Carolina Charter and a quill pen. The 5 C. denomination stamp shown above, at the right (Sc. #1232), was issued on June 20, 1963 to celebrate the 100th Anniversary of West Virginia Statehood. The design of these US stamps features a map of West Virginia and the State Capitol at Charleston. The 5 C. denomination stamp shown above, at the left (Sc. #1231), was issued on June 4, 1963 to publicize the American Food for Peace program and the Freedom From Hunger campaign of the United Nations. The 5 C. denomination stamp shown above, at the right (Sc. #1235), was issued on October 5, 1963 to honor Cordell Hull. Cordell Hull (1871-1955) was an American politician from the State of Tennessee. He represented the State of Tennessee in the U.S. Congress from 1907 to 1933, and he was the Secretary of State of the United States from 1933 to 1944. The 5 C. denomination stamp shown above, at the left (Sc. #1233), was issued on August 16, 1963 to celebrate the 100th Anniversary of the Emancipation Proclamation. There is a big difference between the Emancipation Proclamation and the Abolition of Slavery. The Emancipation Proclamation was a Presidential Order (without the consent of Congress), punitively abolishing slavery in the rebellious Southern states during the American Civil War. It was not until the 13th Amendment to the U.S. Constitution was passed in 1865, that slavery was abolished in the United States. The 5 C. denomination stamp shown above, at the right (Sc. #1234), was issued on August 17, 1963 to publicize the Alliance for Progress. The purpose of the Alliance for Progress was to stimulate economic growth and raise living standards in Latin American countries. The 5 C. denomination stamp shown above, at the left (Sc. #1236), was issued on October 11, 1963 to honor Eleanor Roosevelt, the wife of former President Franklin D. Roosevelt. Anna Eleanor Roosevelt (1884-1962) was an American politician, diplomat, activist, and the former First Lady of the United States. She was an outspoken activist for civil rights and human rights. She was the United States Delegate to the United Nations, where she led the drafting of the Universal Declaration of Human Rights. At the time of her death, she was regarded as "one of the most esteemed women in the World". The 5 C. denomination stamp shown above, at the right (Sc. #1237), was issued on October 14, 1963 to publicize The Sciences and to celebrate the 100th Anniversary of the National Academy of Science. The design of these US stamps depicts an allegorical representation of "the universe". The 5 C. denomination stamp shown above, at the left (Sc. #1238), was issued on October 26, 1963 to celebrate the 100th Anniversary of City Mail Delivery. The design of these US stamps features a Norman Rockwell drawing of a Letter Carrier of 1863. With City Mail Delivery, in the larger cities, the letters were delivered to the address of the addressee by a letter carrier, whereas elsewhere, the addressee had to go to the local post office to pick up their letters. The 5 C. denomination stamp shown above, at the right (Sc. #1241), was issued on December 7, 1963 to honor John James Audubon, the World-famous American ornithologist and artist. The design of these US stamps features Robert Havel's (1793-1878) hand-colored etching of John James Audubon's (1785-1851) drawing called Columbia Jays, though the birds shown in the drawing are actually Collie's Magpie Jays. The 5 C. denomination stamp shown above, at the left (Sc. #1239), was issued on October 29, 1963 to celebrate the 100th Anniversary of the Red Cross. The design of these US stamps features Cuban refugees on-board the S.S. Morning Light and the Red Cross flag. The 5 C. denomination stamp shown above, at the right (Sc. #1243), was issued on March 19, 1964 to celebrate the 100th Anniversary of the Birth of Charles M. Russel, the famous artist of the Old American West. The design of these US stamps features the 1907 painting, Jerked Down, by Charles M. Russell (1864-1926). The 5 C. denomination stamp shown above, at the left (Sc. #1242), was issued on January 10, 1964 to honor Sam Houston. Samuel "Sam" Houston (1793-1863) was an American politician and soldier, most noted for his role in bringing Texas into the United States as a state. He was an active participant in the Texas Revolution and became the first President of the Republic of Texas, following its independence from Mexico. During his long political career, he was a member of the House of Representatives, a senator, and the governor of both Tennessee and the State of Texas. The 5 C. denomination stamp shown above, at the right (Sc. #1245), was issued on April 29, 1964 to honor John Muir, the famous American naturalist and conservationist. The design features John Muir (1838-1914) and a redwood forest. The 5 C. denomination stamp shown above, at the left (Sc. #1244), was issued on April 22, 1964 for the New York World's Fair. The New York World's Fair was held in New York City from April 22 to October 18, 1964 and from April 21 to October 17, 1965. The theme was "Peace Through Understanding", dedicated to "Man's Achievement on a Shrinking Globe in an Expanding Universe", which was symbolized by a twelve-story-high stainless steel model of the Earth, called the "Unisphere" (shown on the stamp above). The fair was attended by over 51 million visitors. The 5 C. denomination stamp shown above, at the right (Sc. #1246), was issued on May 29, 1964 in memory of President John F. Kennedy, assassinated in Dallas, Texas on November 22, 1963. The design features the "Eternal Flame" from Kennedy's grave in Arlington National Cemetery, and a portrait of John F. Kennedy (1917-1963). The 5 C. denomination stamp shown above, at the left (Sc. #1247), was issued on June 15, 1964 to celebrate the 300th Anniversary of the English Colonization of New Jersey. The stamp depicts Philip Carteret (1639-1682) landing at Elizabethtown and a map of New Jersey. Carteret was the first Governor of New Jersey from 1665 to 1673 and the Governor of East New Jersey from 1674 to 1682. The design of these US stamps comes from a mural by Howard Pyle (1853-1911) in the Essex County Courthouse, Newark, New Jersey. The 5 C. denomination stamp shown above, at the right (Sc. #1249), was issued on August 1, 1964 to encourage Americans to Register and Vote, in a campaign to draw more voters to the polls. The design of these US stamps features the 50-star United States flag. The 5 C. denomination stamp shown above, at the left (Sc. #1248), was issued on July 22, 1964 to celebrate the 100th Anniversary of Nevada Statehood. The design features a view of Virginia City, Nevada and a map of Nevada. The 5 C. denomination stamp shown above, at the right (Sc. #1252), was issued on October 15, 1964 to celebrate the 50th Anniversary of the founding of the American Society of Composers, Authors, and Publishers. The design features a lute, horn, laurel, oak, and a musical score. The 5 C. denomination stamp shown above, at the left (Sc. #1250), was issued on August 14, 1964 to commemorate the 400th Anniversary of the Birth of William Shakespeare. The design features a portrait of William Shakespeare (1564-1616), the English poet, playwright, and actor that has been regarded as the "greatest writer in the English language" and the World's "preeminent dramatist". The 5 C. denomination stamp shown above, at the right (Sc. #1251), was issued on September 11, 1964 to honor the Doctors Mayo. Dr. William James Mayo (1861-1939) and his brother, Dr. Charles Horace Mayo (1865-1939), were surgeons who founded the Mayo Foundation for Medical Education and Research, also known as the Mayo Clinic, in 1889 in Rochester, Minnesota. The 5 C. denomination stamp shown above, at the left (Sc. #1253), was issued on October 26, 1964 to honor American women as Homemakers. The design features a rural scene. The 5 C. denomination stamp shown above, at the right (Sc. #1259), was issued on December 2, 1964 to honor the Fine Arts. The stamp depicts an Abstract Design by Stuart Davis (1892-1964), an early American modernist painter. The 5 C. denomination stamp shown above, at the left (Sc. #1258), was issued on November 21, 1964 for the Opening of the Verrazano-Narrows Bridge, connecting Staten Island and Brooklyn. The design features a view of the Verrazano-Narrows Bridge and a map of New York Bay. The 5 C. denomination stamp shown above, at the right (Sc. #1260), was issued on December 15, 1964 to honor Radio Amateurs and to celebrate the 50th Anniversary of the American Radio Relay League. The design features radio waves and a dial. The annual 5 C. denomination Christmas stamp shown above (Sc. #1240, #1240a) was issued on November 1, 1963. The design features the U.S. National Christmas Tree, with the White House in the background. 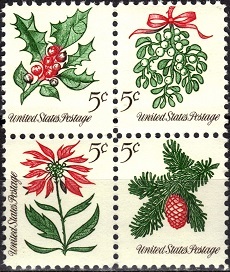 The four annual 5 C. denomination Christmas stamps shown above (Sc. #1257b, #1257c) were issued on November 9, 1964. The designs feature decorative holiday plants, which are holly, mistletoe, a poinsettia, and a conifer sprig. The second catalog numbers indicated above are those of the phosphor tagged issues.